You’ll be amazed at how much water you can save effortlessly and comfortably with these products.Each water saver can be easily installed in minutes and helps conserve thousands of gallons of water each year. Increased water efficiencies and reduced water usage also result in savings in energy by reducing demand on your hot water heater, water well, or septic system. In fact, you can save enough money to pay for the cost of the kit in no time. SmartFLOW™ Efficient Massaging Showerhead - Traditional high flow rate showerheads waste thousands of gallons of water each year. Replacing your old showerhead with an efficient showerhead saves water while providing you with a relaxing and satisfying shower. This showerhead provides three spray settings: massage, regular, and combination spray. The WaterSense® labeled water efficient design exceeds the national energy and water efficiency standards (ANSI/ASME A112.18.1). Saves up to 7,500 gallons of water annually for a family of four. TouchFLOW™ Premium Dual Spray Swivel Aerator does everything you need your kitchen faucet to do using just 1.5 gallons per minute. You can switch between a single and multiple stream spray with an easy push or pull of the aerator head. 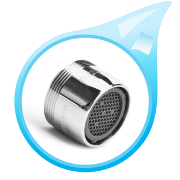 A convenient Touch Flow design maintains water temperature and provides intermittent rinsing. The swivel design allows you to target the spray to needed areas. It fits both male and female thread kitchen faucets. The WaterSense® labeled water efficient design exceeds the national energy and water efficiency standards (ANSI/ASME A112.18.1). Saves up to 7,500 gallons of water annually. MasterFIT™ Universal Dual Thread Bathroom Faucet Aerator improves flow performance, reduces splash, and saves water in bathroom sinks. It uses only 1.5 gallons per minute. The aerator is made of brass and fits both male and female bathroom faucet spouts. The WaterSense® labeled water efficient design exceeds the national energy and water efficiency standards (ANSI/ASME A112.18.1). Saves up to 7,500 gallons of water annually per aerator. 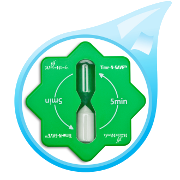 TIME-N-SAVE™ Hour Glass Shower Timer - Taking shorter showers is a great way to save water. This Time-N-SAVE™ five minute hourglass provides an easy way to monitor and reduce shower time. Simply turn over the timer on its suction cup backing to start your five minute countdown. 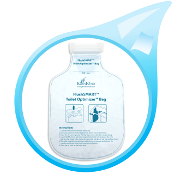 FlushSMART™ Toilet Tank Optimizer Bag is a durable, low cost, maintenance free, and user-friendly toilet tank water saver. It is easy to install and is designed to hang on the inside of the toilet tank wall without decreasing flushing performance. It displaces—and therefore saves—up to 1 gallon of water per flush because the toilet tank never needs to refill the space occupied by the FlushSMART Toilet Tank Optimizer bag. Saves up to 4,400 gallons of water annually. 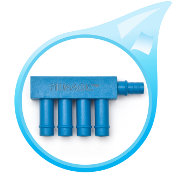 Toilet Tank FillMAGIC™ Diverter Valve saves 0.5 to 1.5 gallons of water per flush. The toilet tank and bowl fill at the same time, but they don't fill at the same rate — the bowl fills faster. Because the fill valve doesn't shut off until the tank is full, water continues to be fed to the bowl. So, where does this extra water go? Straight down the drain! The FillMAGIC™ Diverter Valve fills the toilet tank faster and reduces water loss through the bowl by dividing the flow between the overflow tube and directing a portion of the flow into the toilet tank itself. Install easily without tools. 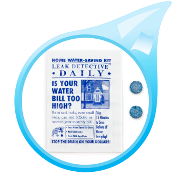 Flapper LeakDETECT™ Tablets - A leaky toilet tank flapper is one of the most common causes of water loss in the home. Diagnosing leaky toilet flappers and replacing them in a timely manner can save thousands of gallons of water each year. Simply drop a tablet in the toilet tank. If the toilet turns blue, then you need to replace the flapper. Tablets contain only FDA certified, non-toxic, non-carcinogenic pigments. Saves up to 3,000 gallons each year.